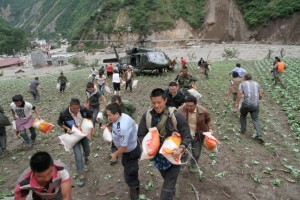 China has allocated $37.24 million for flood relief in 12 of its worst hit provinces, says the Ministry of Finance (MOF). Funds will be used for flood control efforts and to repair damages to facilities. Flooding has caused heavy damage in several Chinese provinces, with many areas receiving a record amount of rainfall. The allocated funds are set to be used in the provinces of Fujian, Zhejiang Guangdong, Jiangxi, Anhui, Hebei, Shanxi, Henan, Liaoning and Shaanxi, and the Ningxia Hui and Tibet autonomous regions. Flooding in China this year has left at least 337 people dead and 213 missing, says China’s flood control authorities. A total of 2.77 billion yuan from the central budget has been allocated to flood control and drought relief efforts this year, the MOF said. Authorities have warned of further flooding in some of the provinces. The National Meteorological Centre said the provinces of Gansu, Shaanxi, Sichuan, Henan and Guangdong will see 24-hour rainfall with some areas receiving 100 to 200 mm of rain.